Ex Astris Scientia - Observations in TNG: "The Loss"
Here are some observations about sets, props and visual effects in TNG: "The Loss" without a specific theme, and a comparison of the original TV release (TNG) with the remastered episode (TNG-R). 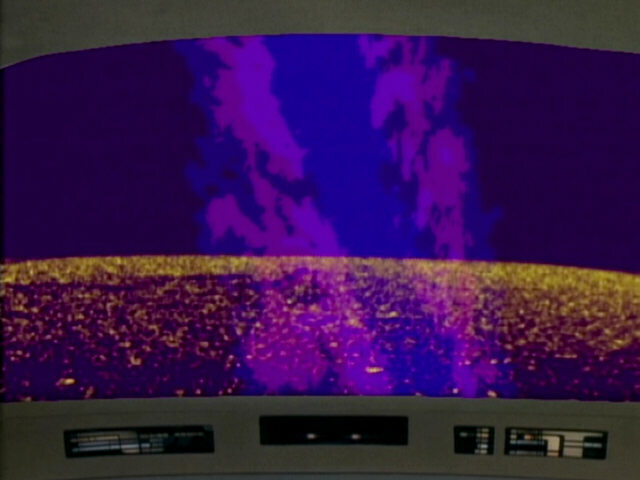 In this episode and in "Data's Day", the backdrop in Troi's office is unusually blue. 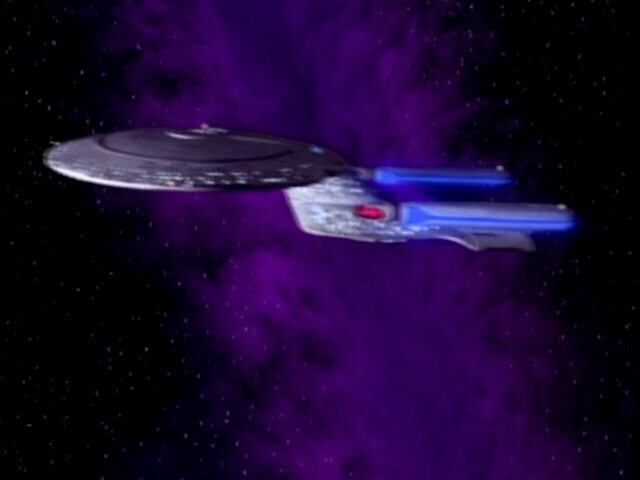 In previous episodes, it used to be pink. 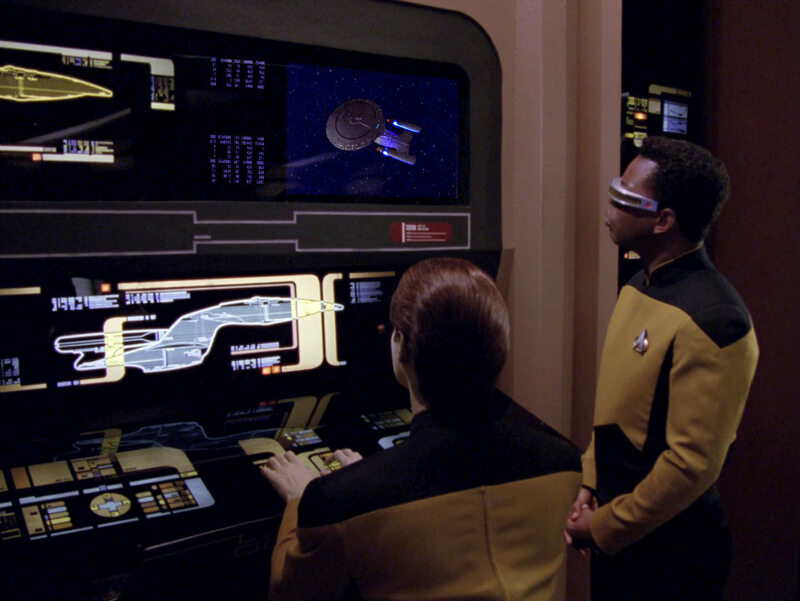 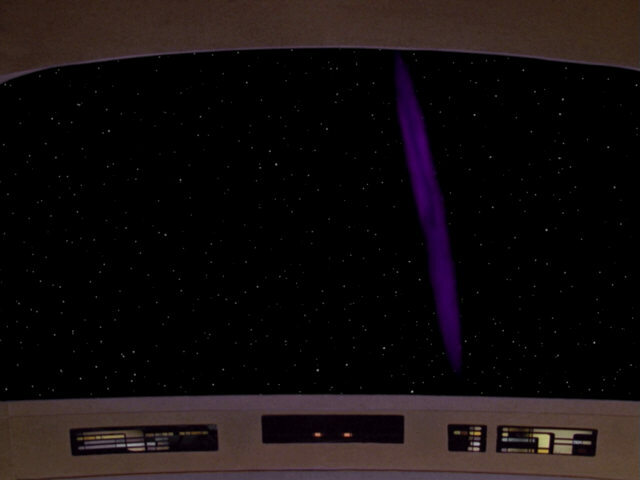 "Hollow Pursuits" In TNG-R we can see that the darker (opaque) stripes on the pane are still reddish. 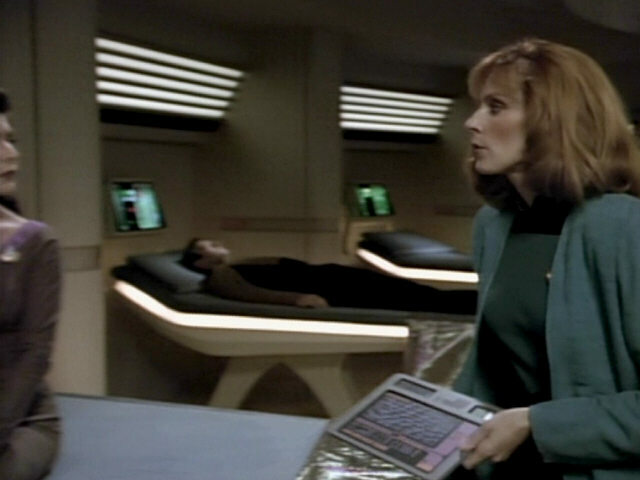 Dr. Crusher's medical case. 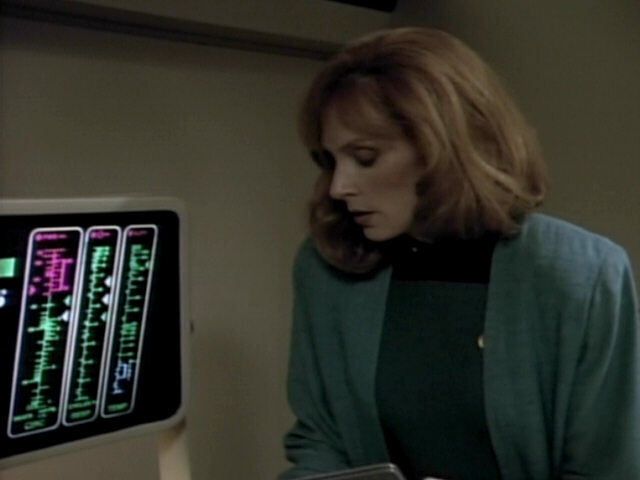 The name "Beverly G. Crusher" can be read in HD. 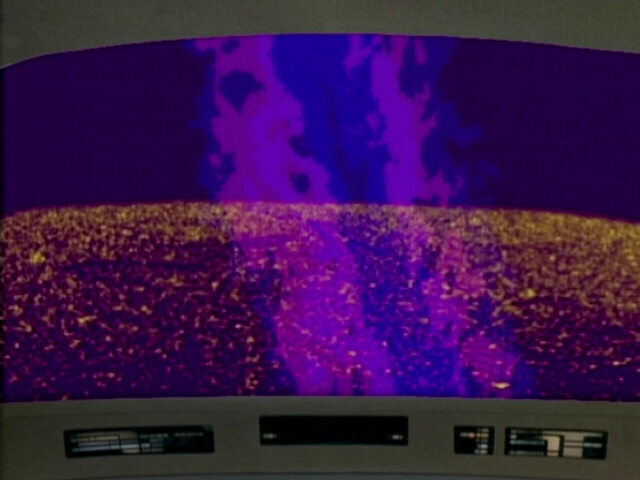 The middle initial "G" (most likely for "Gates") was also seen in "Sins of the Father", where it briefly appeared on screen. 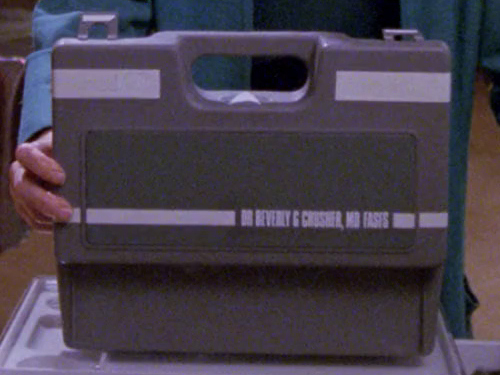 In "Conundrum", her middle initial is given as "C.", however, most likely for "Cheryl". 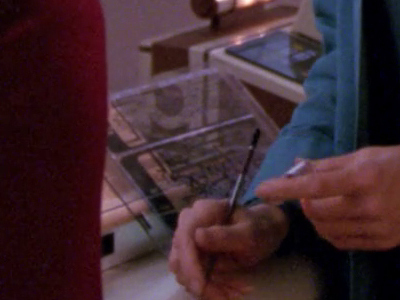 In an invitation to Beverly and Jack Crusher's wedding created for the Picard family album, finally, her middle initial is "S". 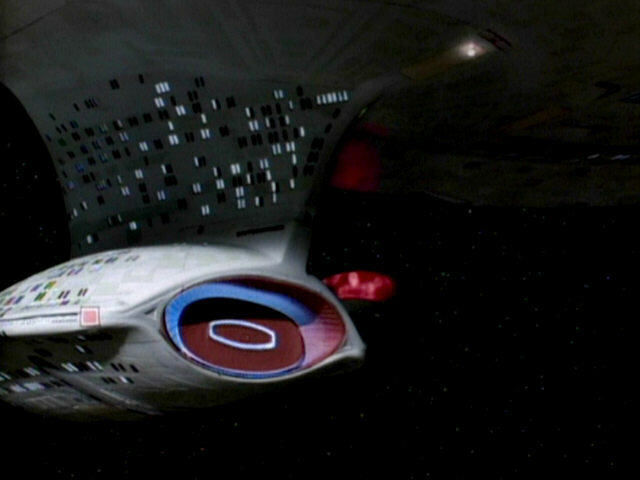 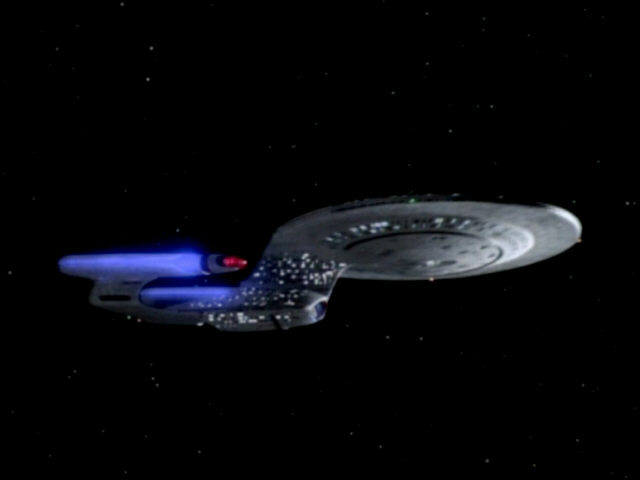 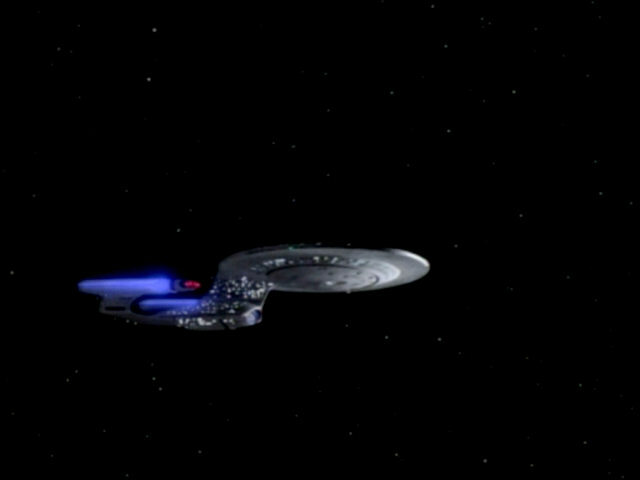 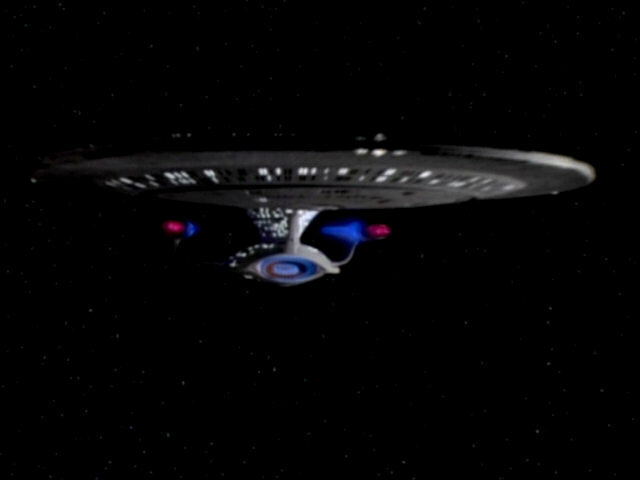 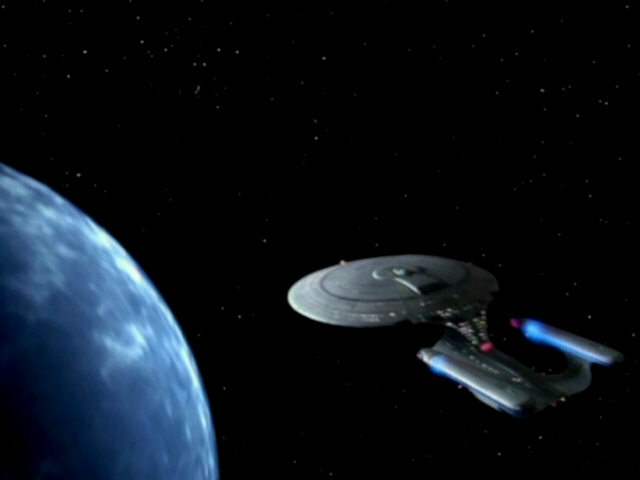 This shot of the USS Enterprise-D slowly drifting away from the camera was filmed especially for this episode, using the 4-foot model of the ship. 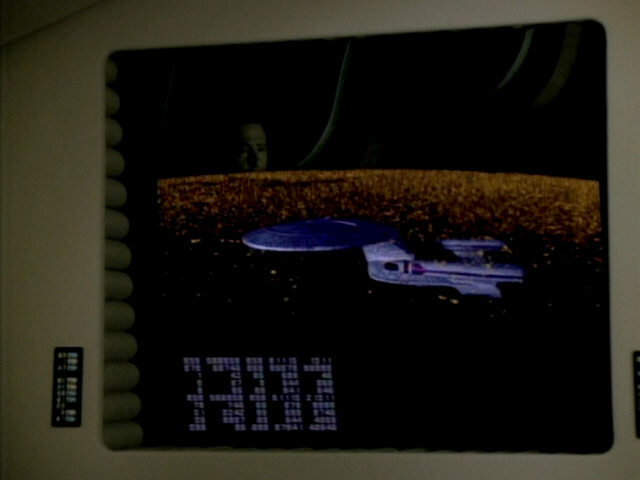 Screenshots from "Manhunt" and "Evolution" show the 2- and 6-foot models from a similar perspective. 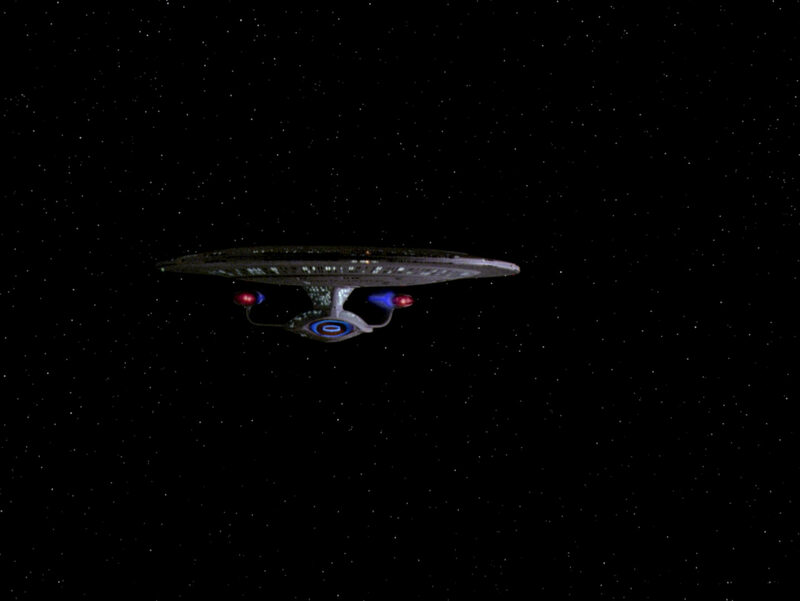 "Manhunt" The shot of the ship in HD. 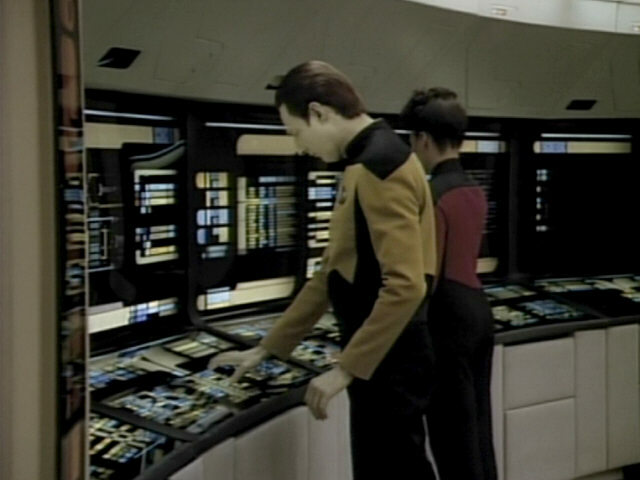 The biobed monitor display can be seen up close in this shot. 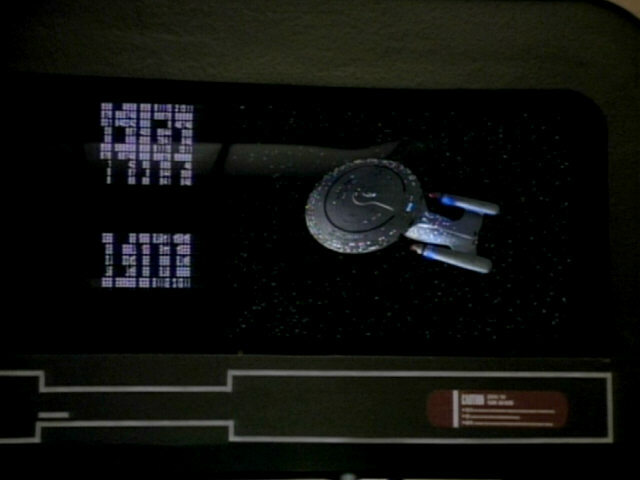 The HD close-up of the display allows to read the labeling. 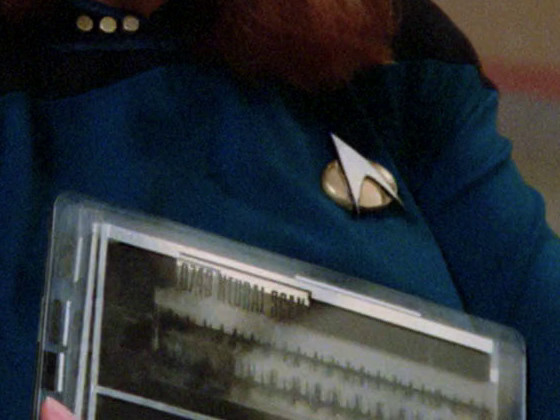 The large PADD Doctor Crusher is holding here first appeared in "The Bonding", where it was used as the video PADD Jeremy Aster watches old home videos on. 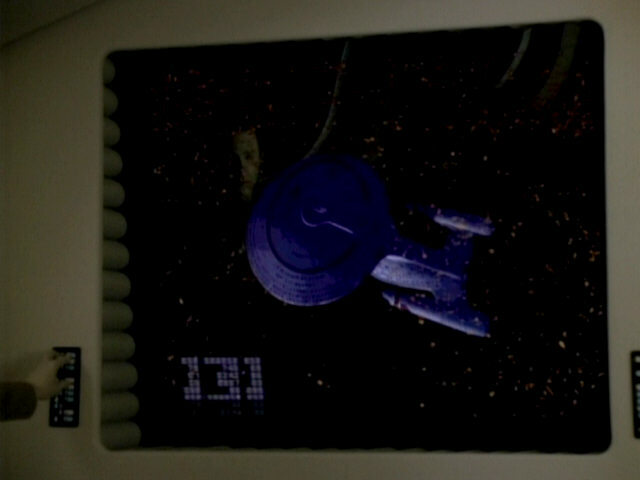 This PADD (or similar PADDs) also appeared in other season 4 episodes, like "Future Imperfect" or "Final Mission". 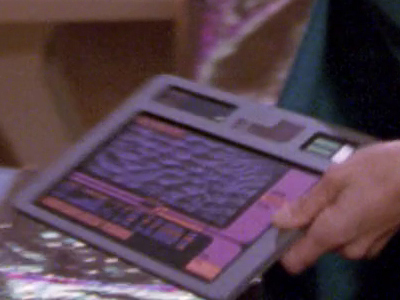 "Future Imperfect" In HD, it can be seen that the PADD displays cells, most likely brain cells. 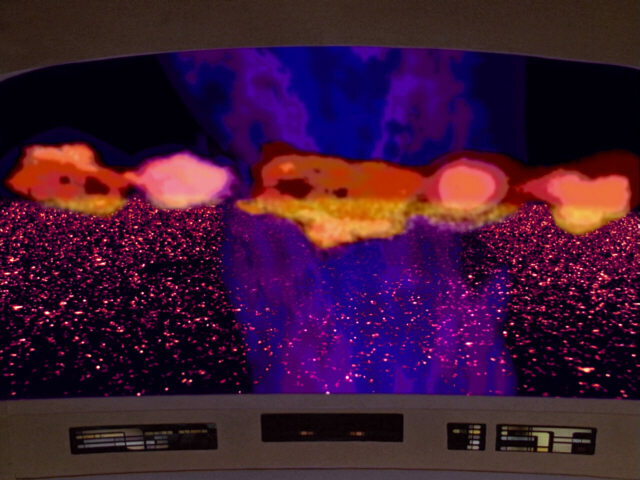 The graphic looks similar to the one seen in "Transfigurations", also depicting cells. 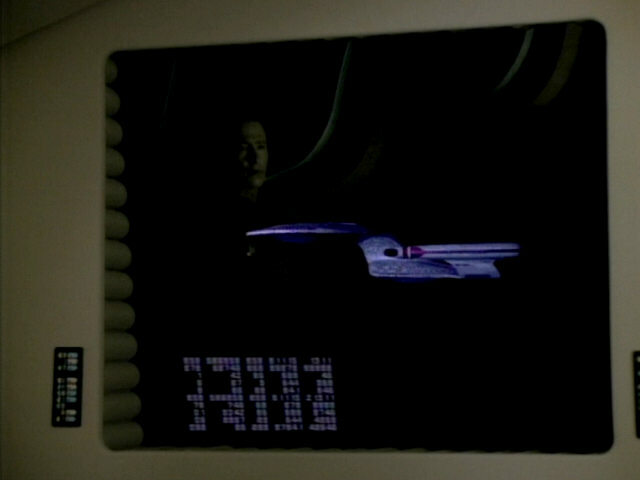 Another new shot of the 4-foot model, slowly drifting sideways towards the camera. 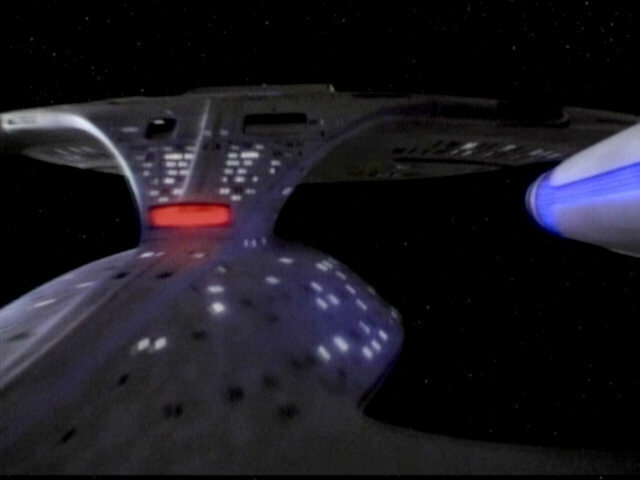 Comparison screenshots show what the 6-foot model looks from this angle. 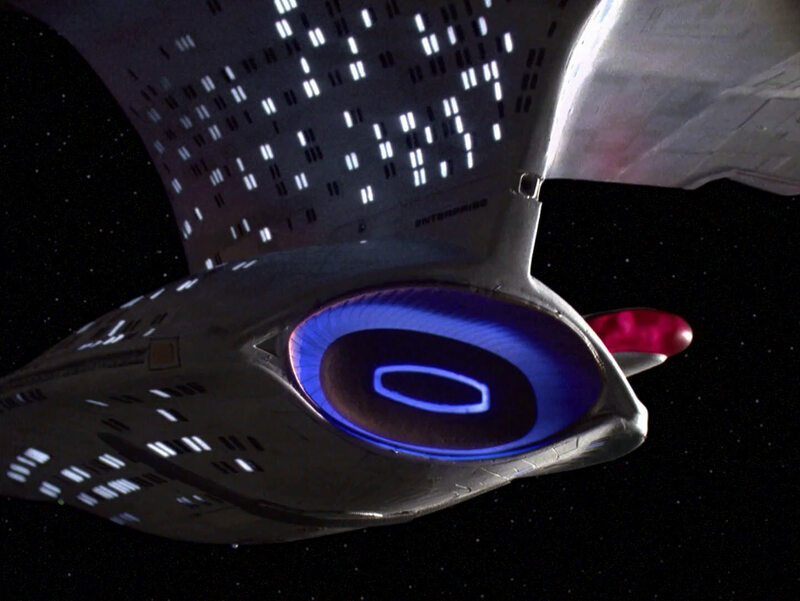 "Q Who" The shot of the ship in HD. 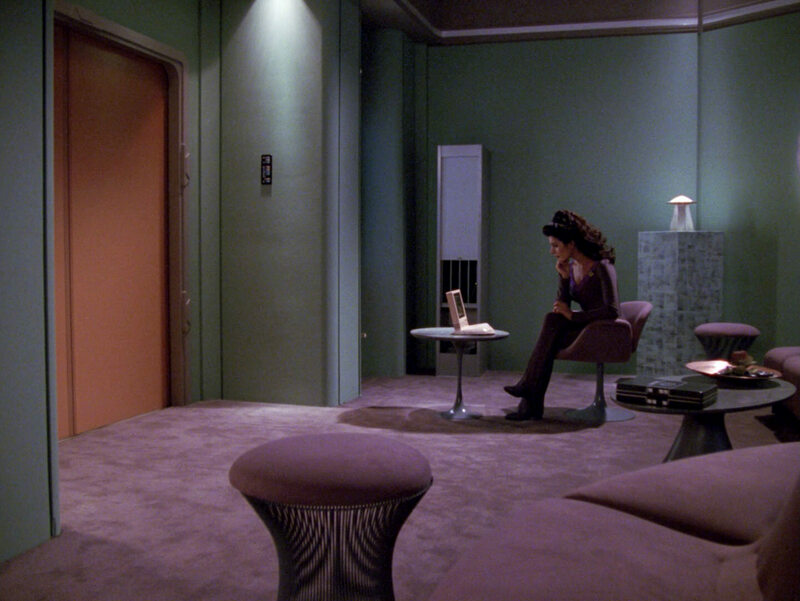 Two nice shots that show the full size of Troi's office. The enclosed shelving unit in the background was especially added for this episode and only appears here. 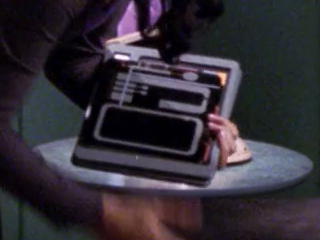 Troi uses it in two scenes, when she takes out Ensign Brooks's music box and when she packs some PADDs into a case. 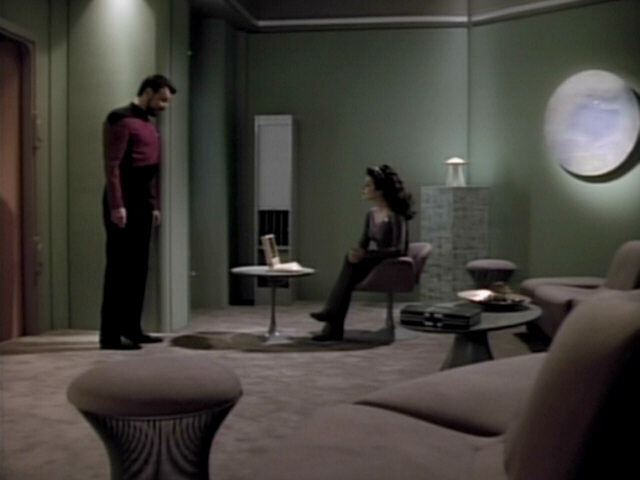 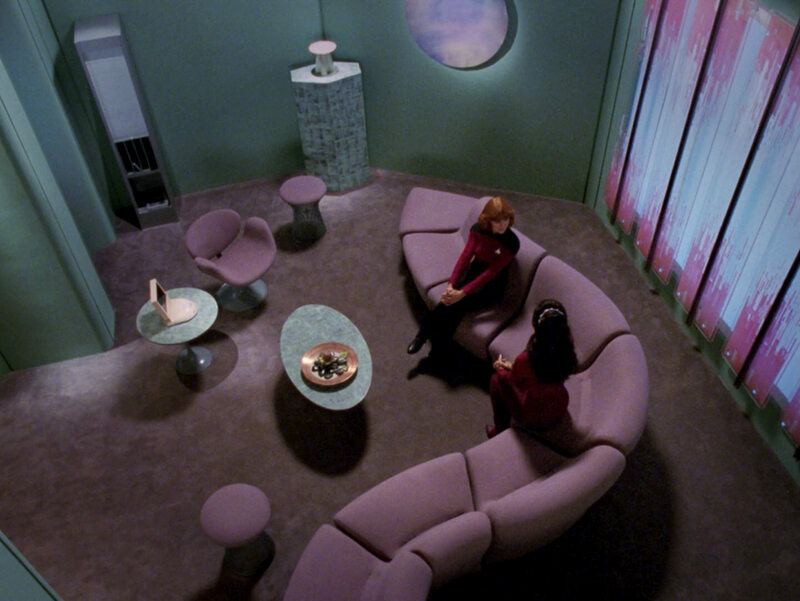 There is much more contrast between the green walls and the reddish floor in TNG-R. 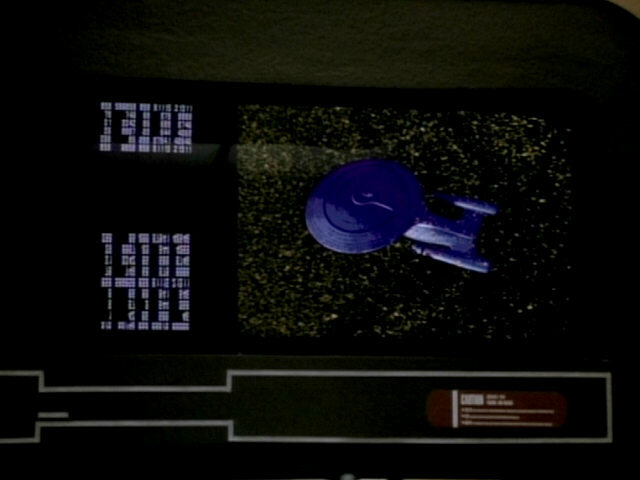 The footage appearing on the monitor was filmed using the 4-foot model of the USS Enterprise-D. The different scans had to be recreated for the remastering of the episode. 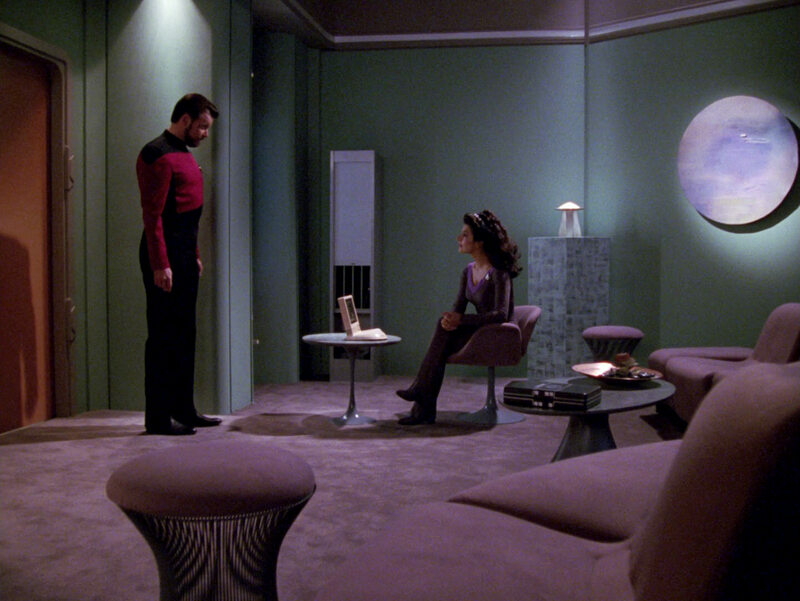 Another good look at Troi's office. 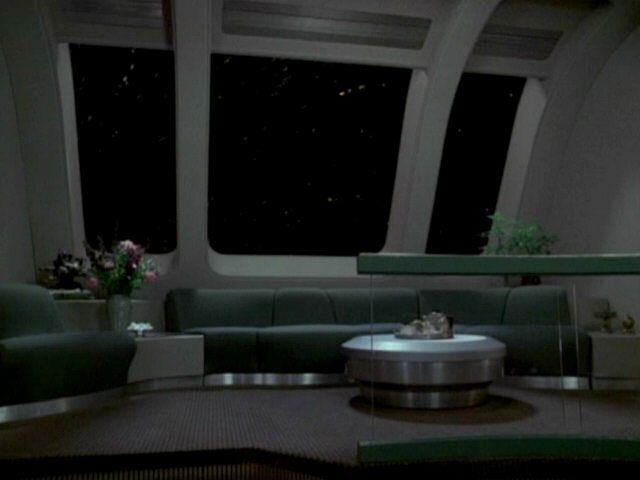 The serpentine couch is similar to a couch later installed in Janeway's ready room aboard the USS Voyager. 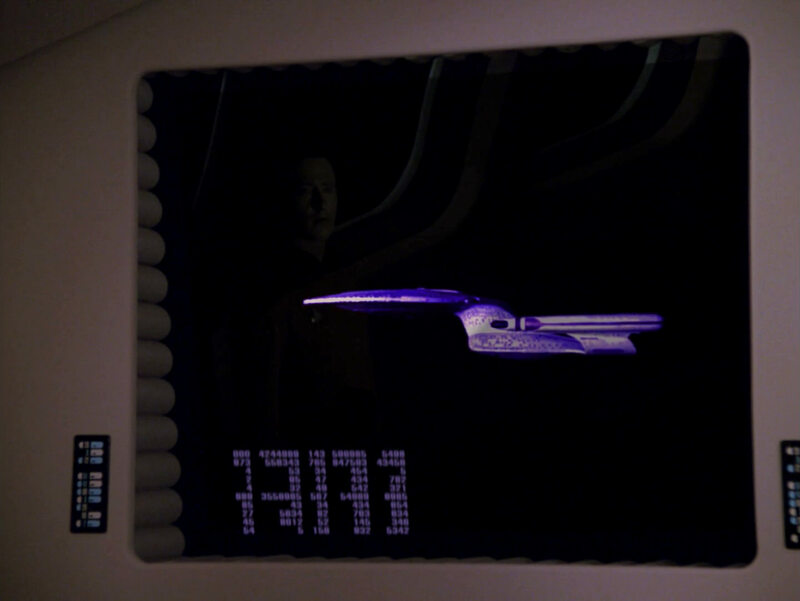 "Scorpion I" The shot in HD, once again clearly showing the still pink stripes on the glass panes. 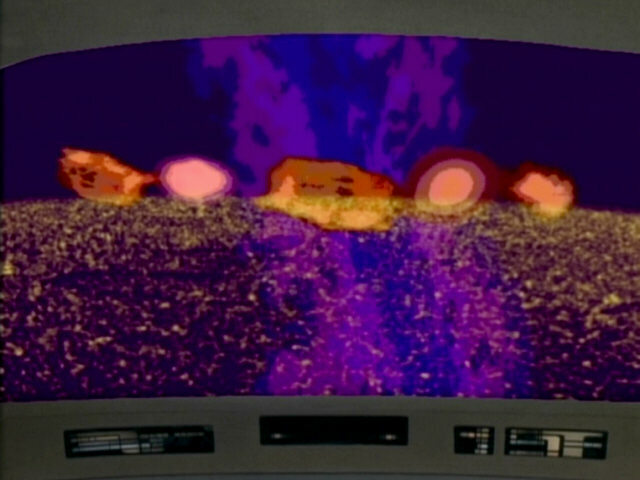 An animation showing the two-dimensional lifeforms encountered in this episode. 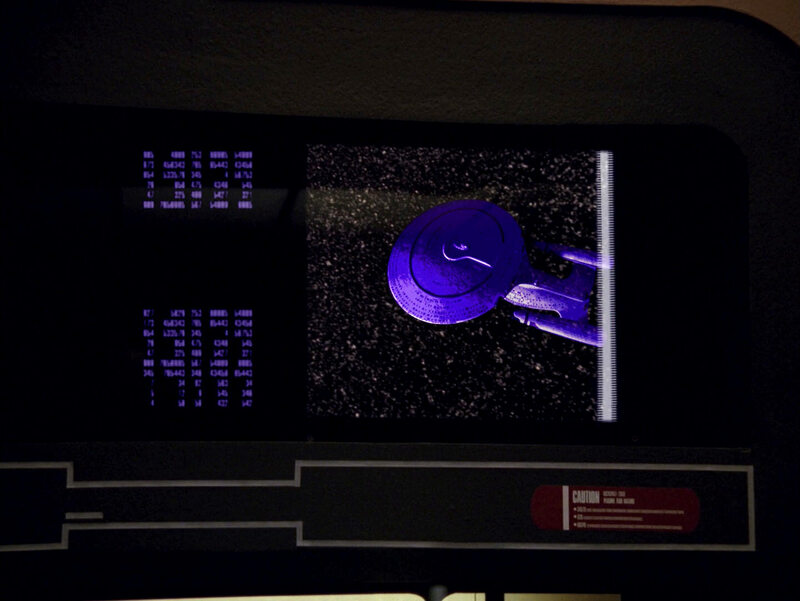 The new screens in HD. 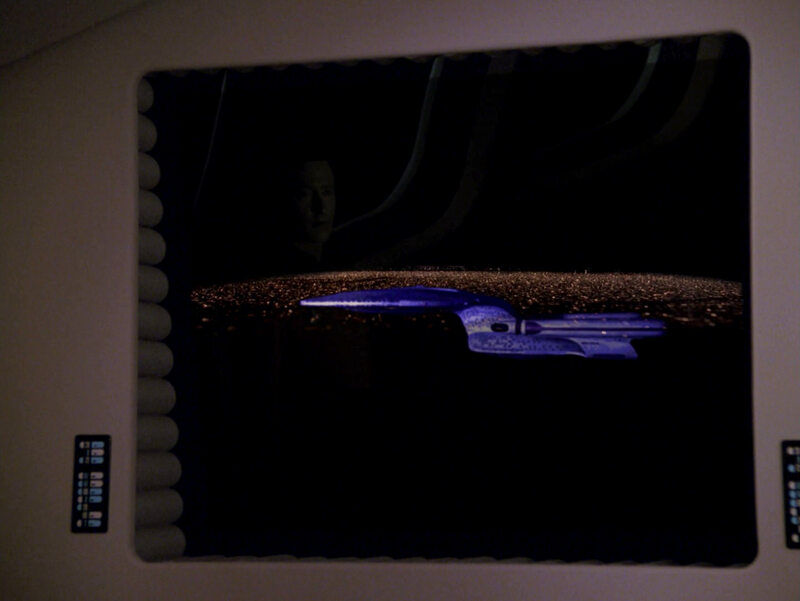 Data's reflection on the monitor is still there, but has fallen victim to the contrast adjustment in the remastering process. 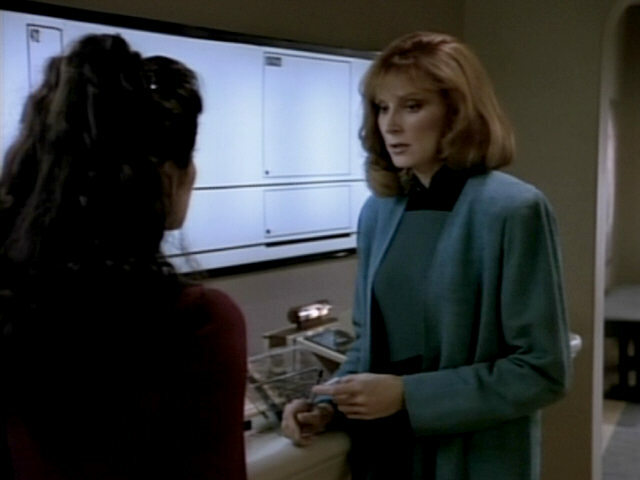 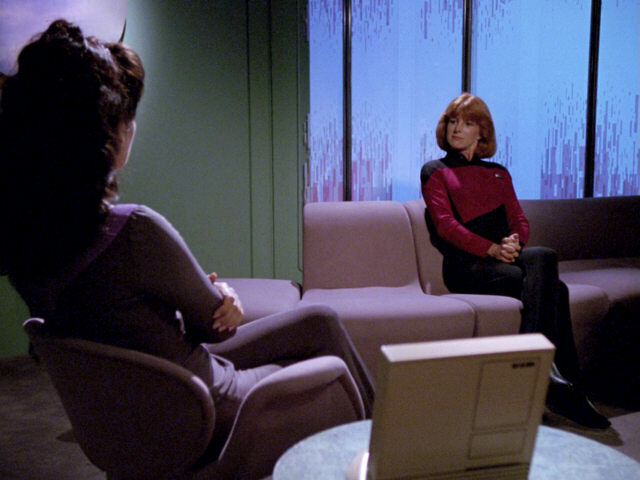 A transparent PADD can be seen on the table behind Dr. Crusher. 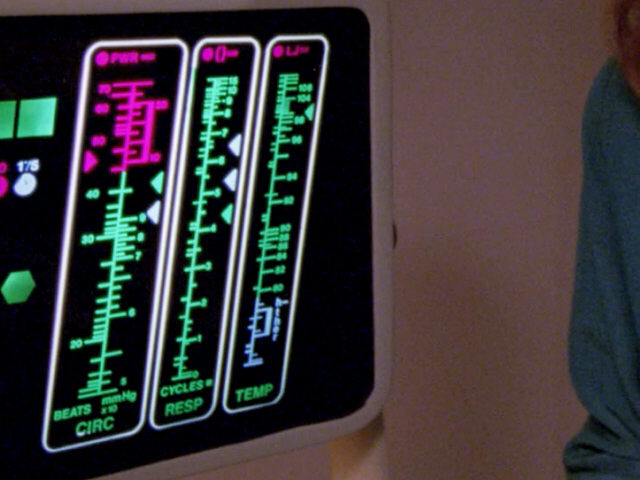 These PADDs are almost exclusively used by the Doctor, as they can contain medical data, and first appeared in "Symbiosis". 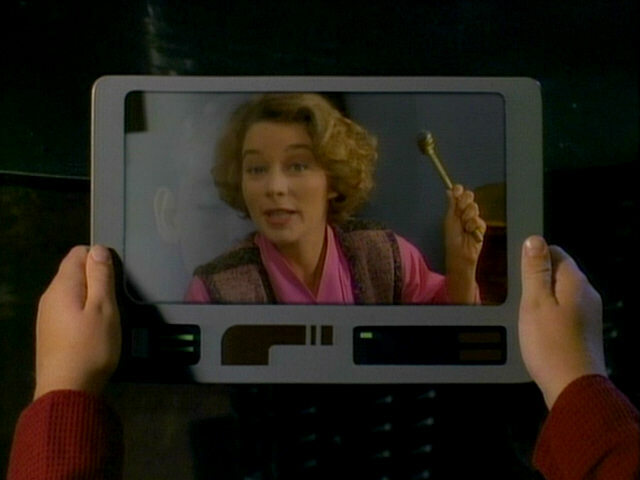 "Symbiosis" HD An HD close-up of the transparent PADD. 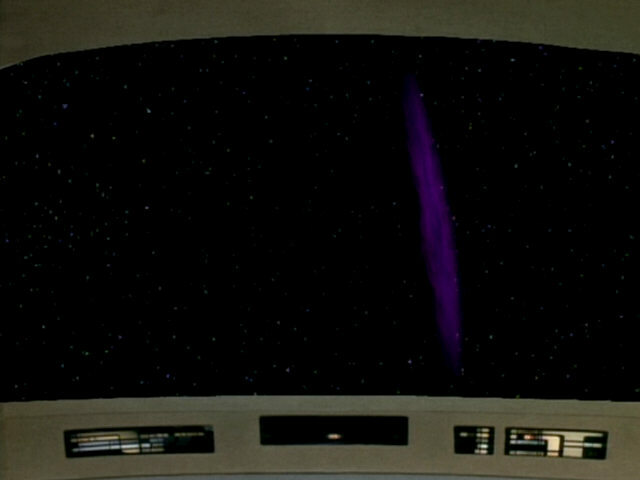 A first look at the cosmic string on the main bridge viewscreen of the USS Enterprise. 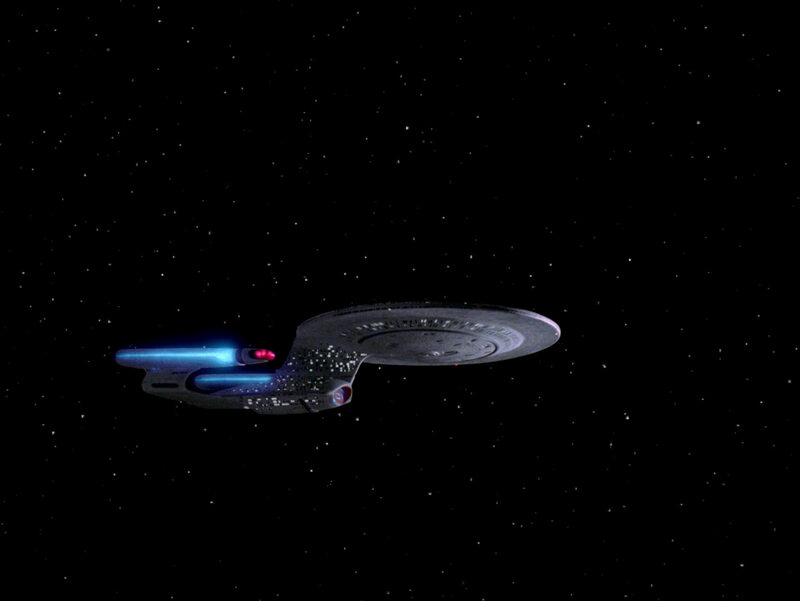 The reconstructed shots in HD. 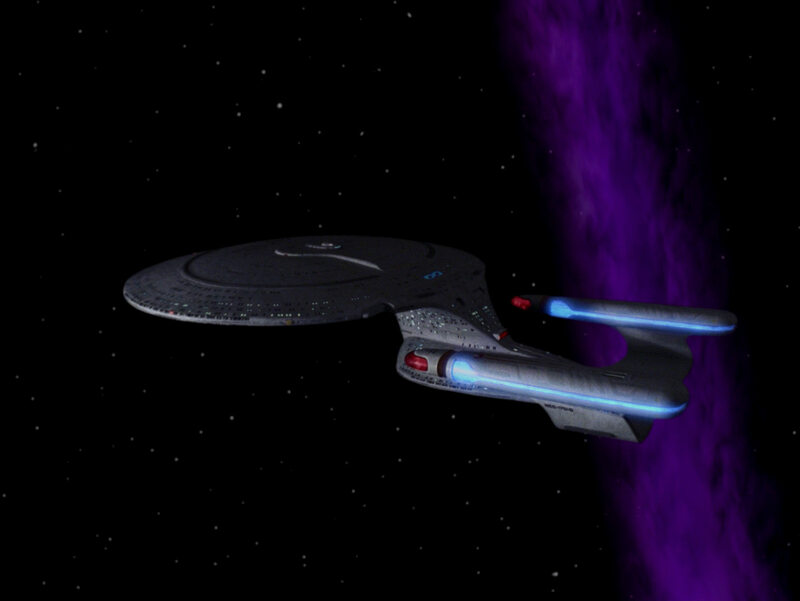 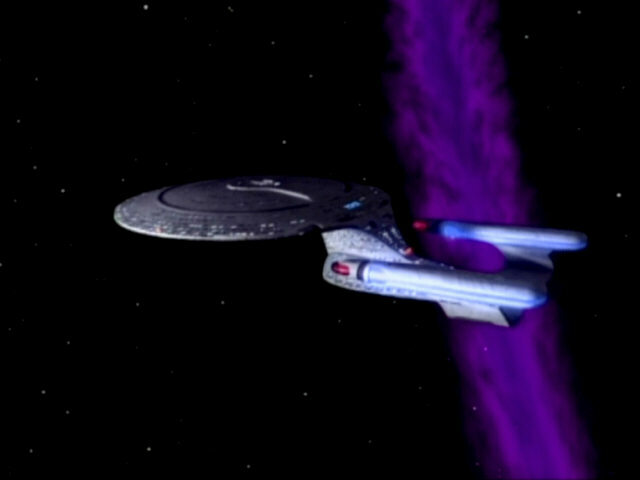 The USS Enterprise-D drifts toward the cosmic string. 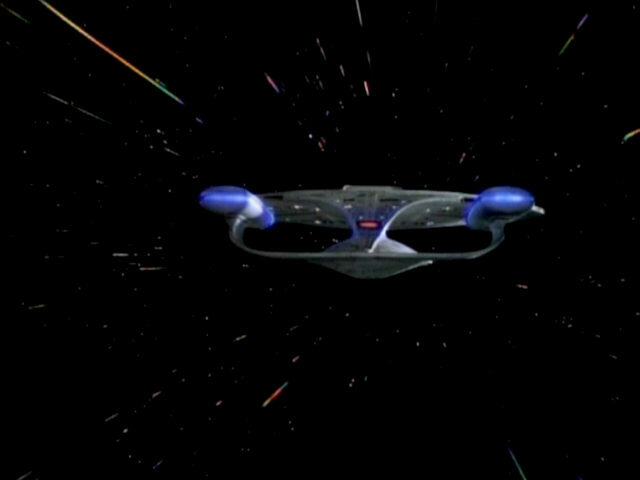 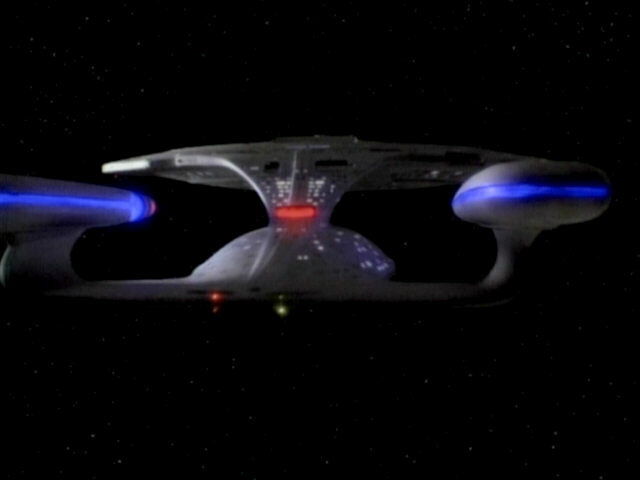 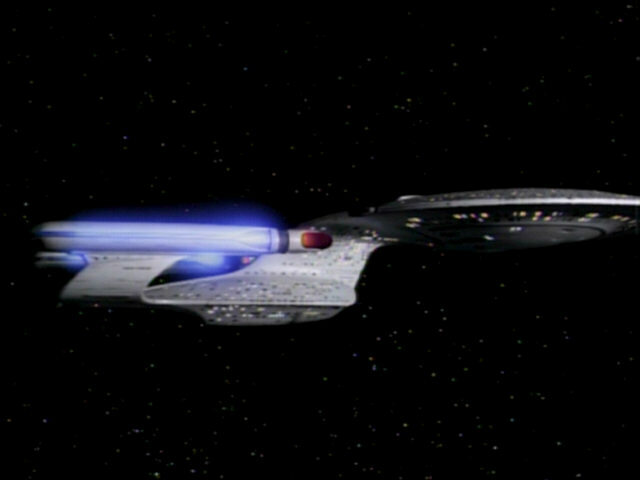 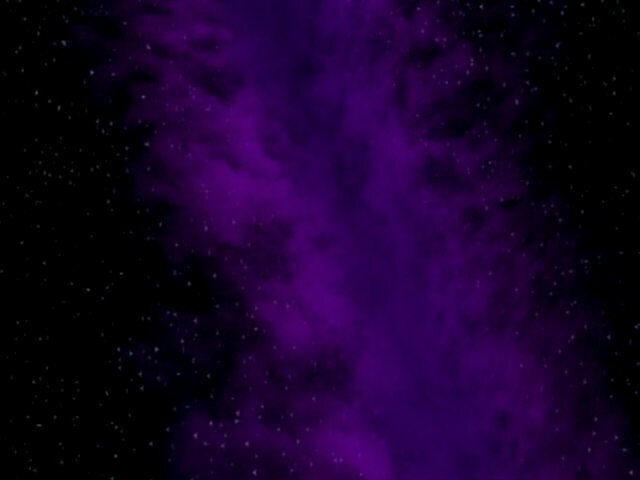 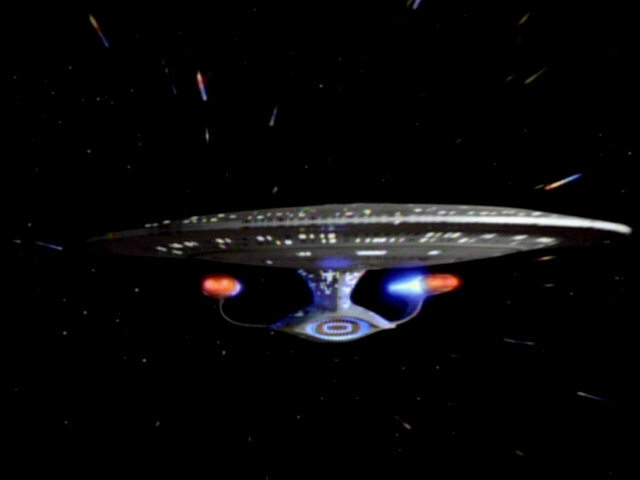 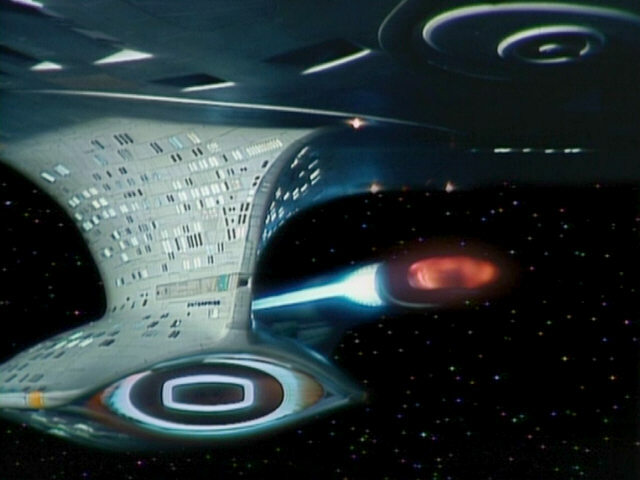 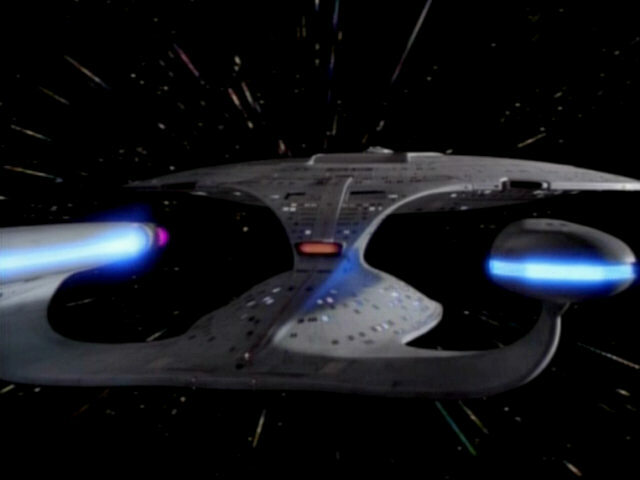 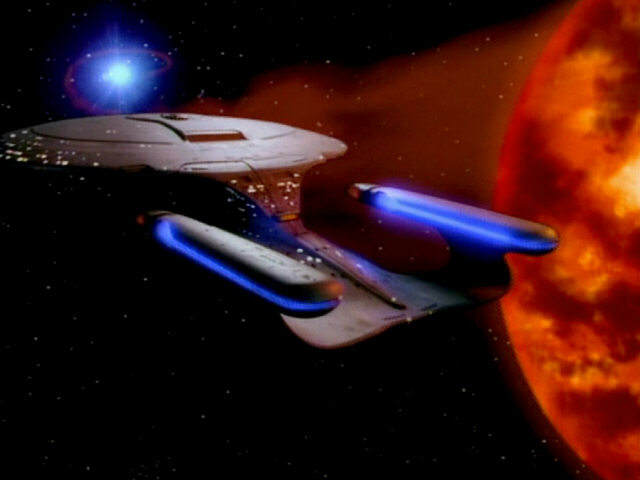 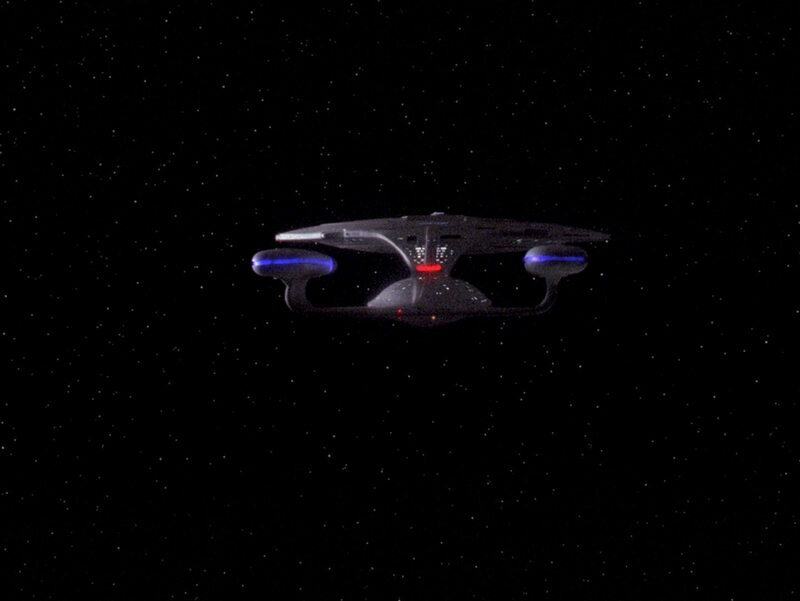 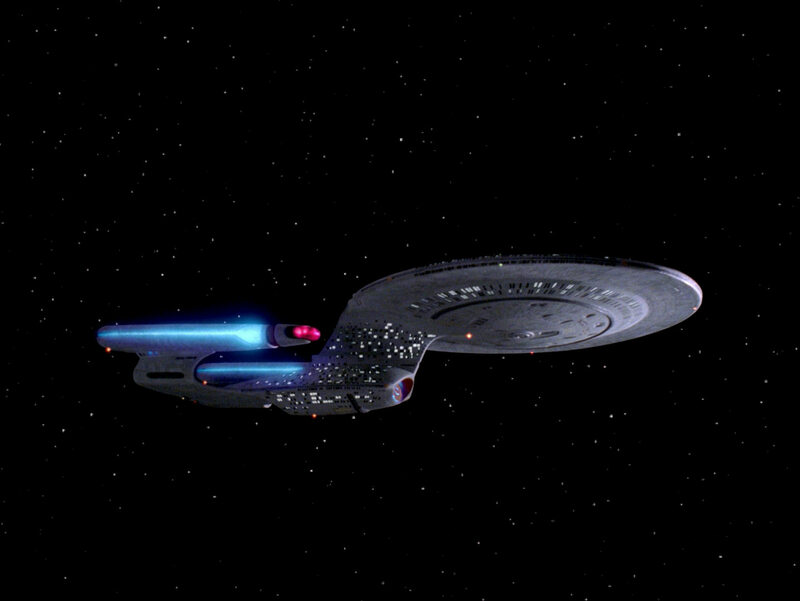 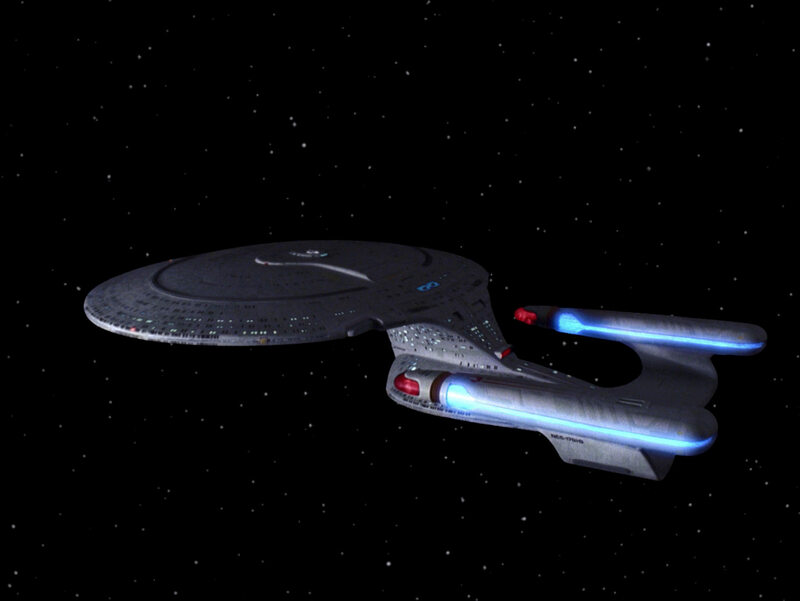 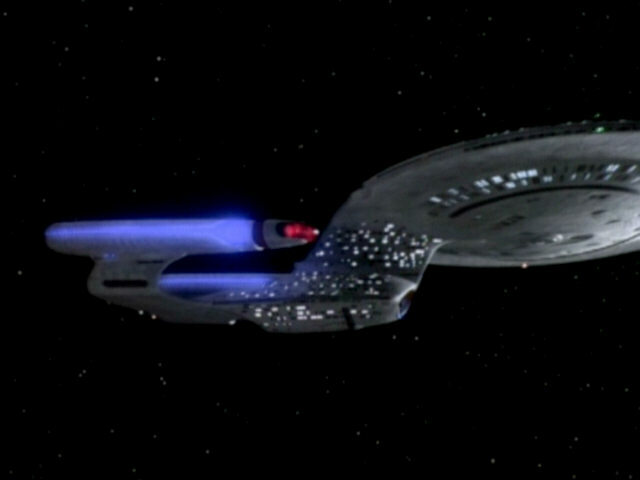 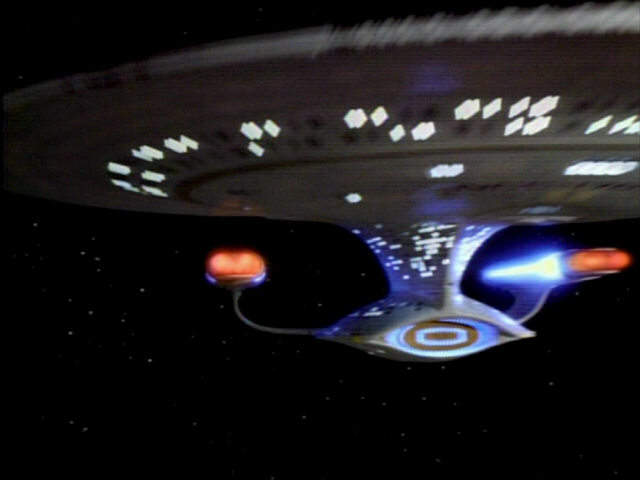 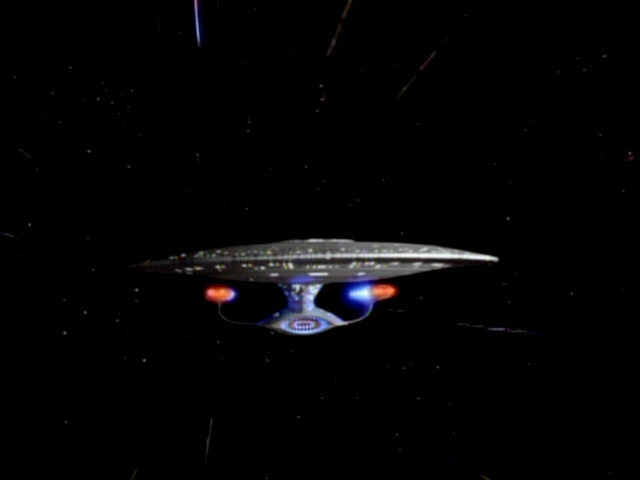 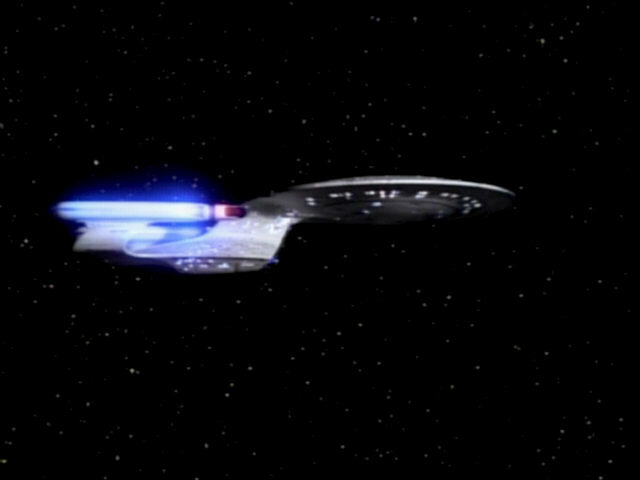 A sensor scan of the cosmic string, the two-dimensional lifeforms and five photon torpedoes exploding. 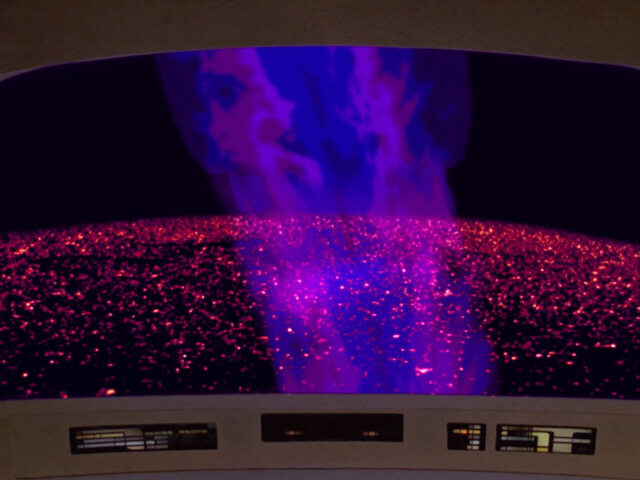 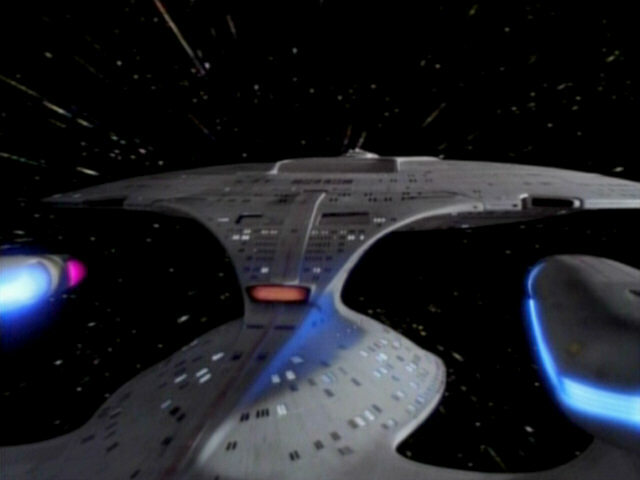 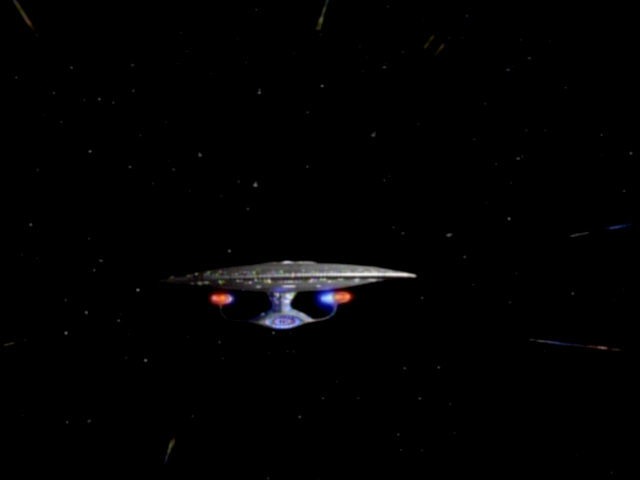 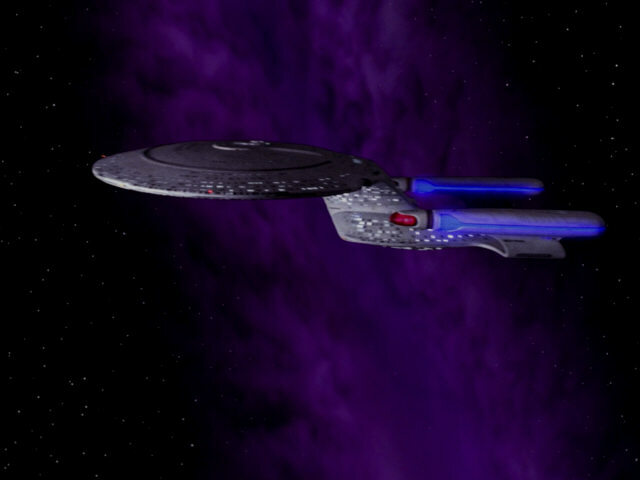 The two-dimensional lifeforms are not blurry any longer in TNG-R, and the cosmic string is now three-dimensional. 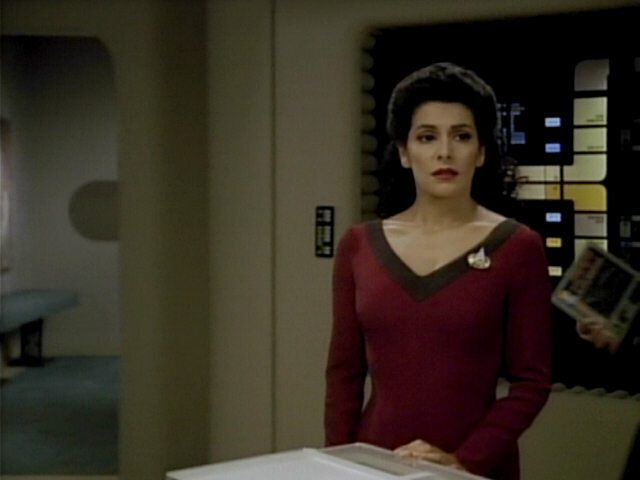 Counselor Troi is packing several PADDs seen in earlier episodes. 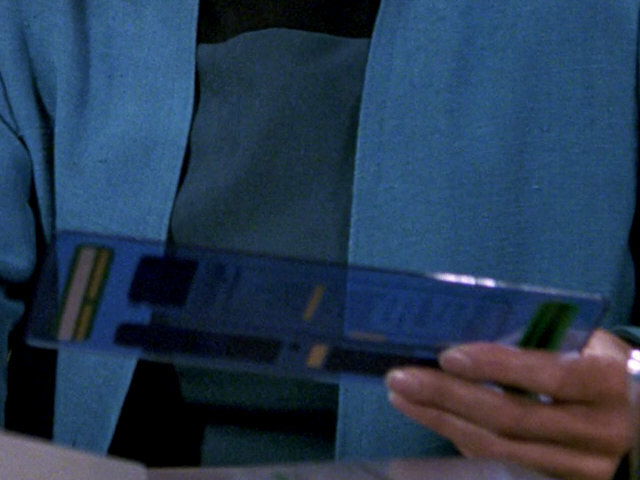 The transparent blue PADD is often used by Dr. Crusher in sickbay. 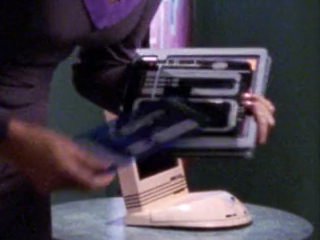 The second black PADD was seen up close in "Captain's Holiday". 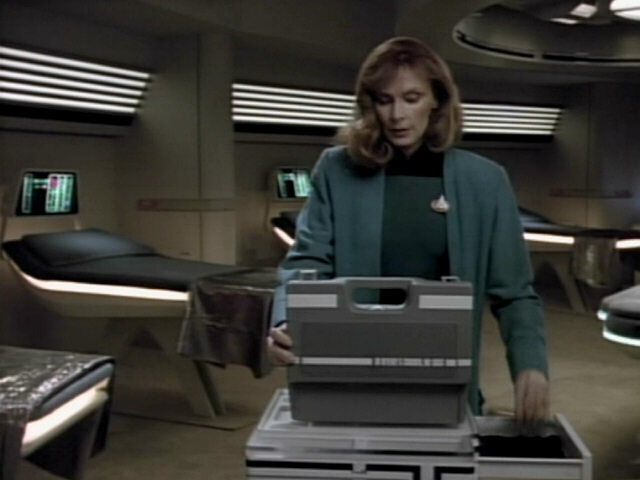 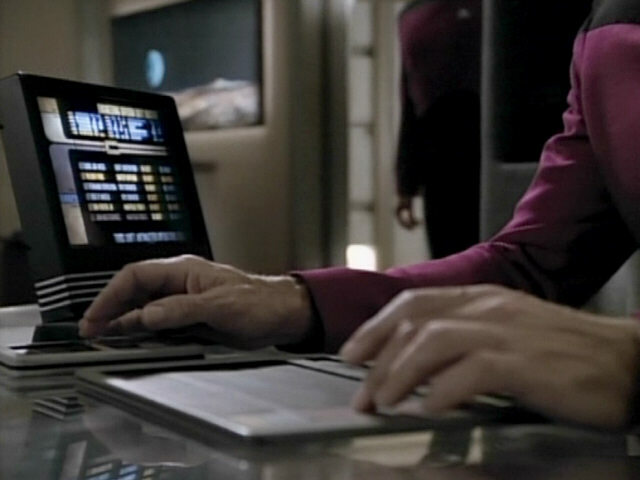 The third PADD is similar in design to the large PADD held by Doctor Crusher in sickbay earlier in the episode. 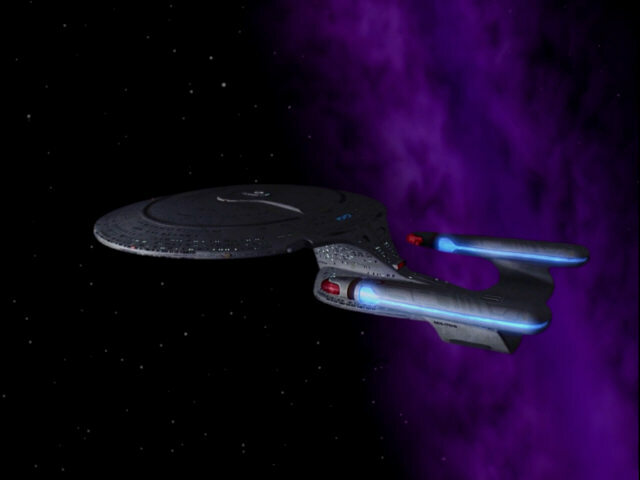 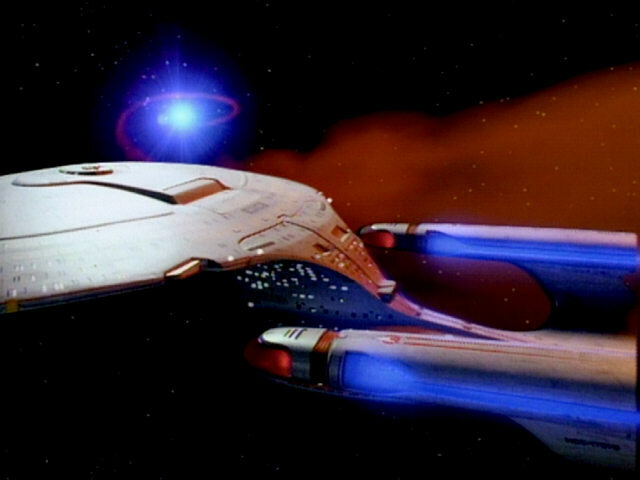 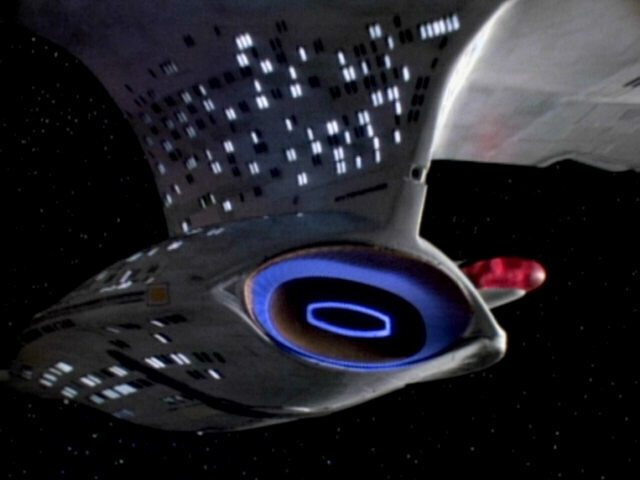 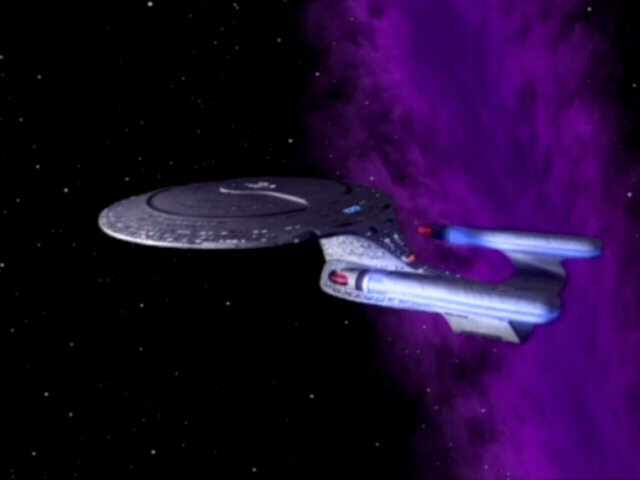 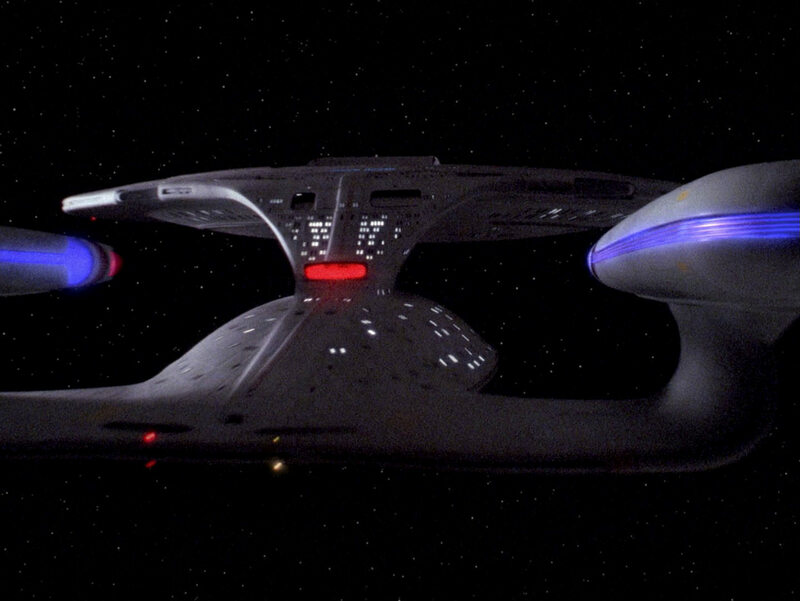 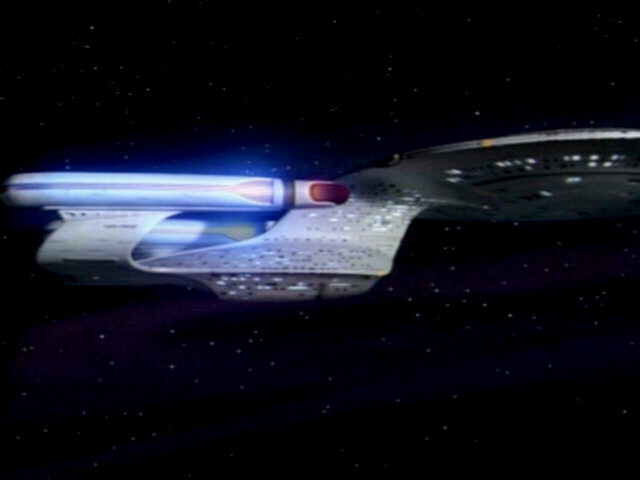 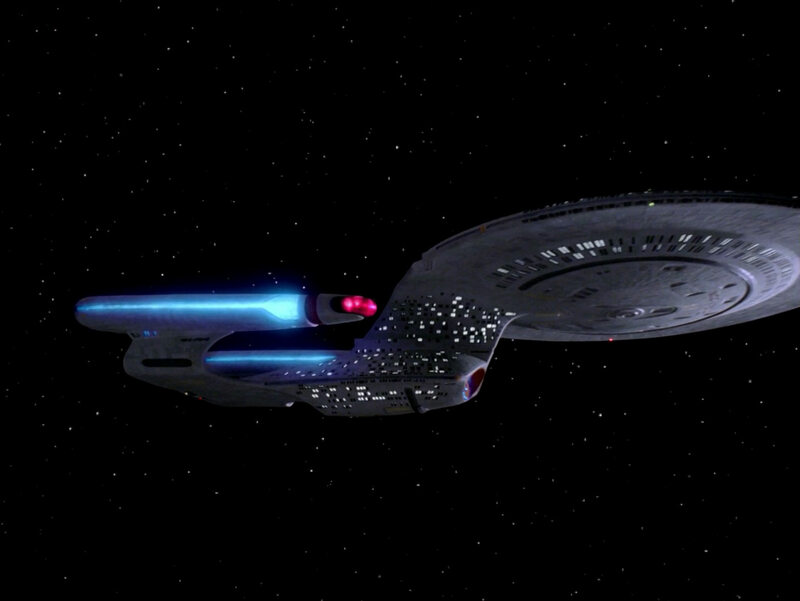 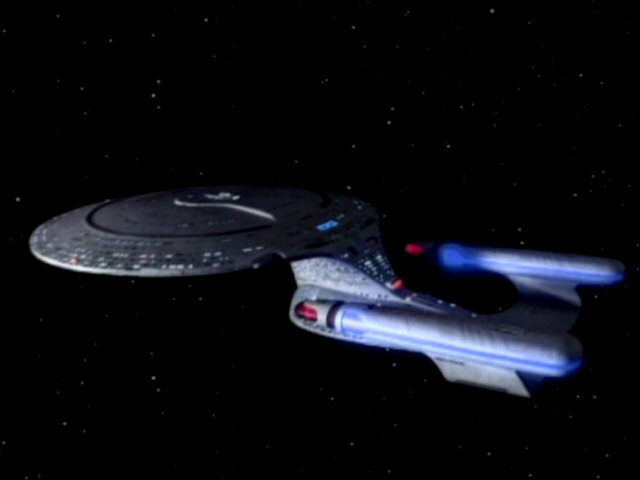 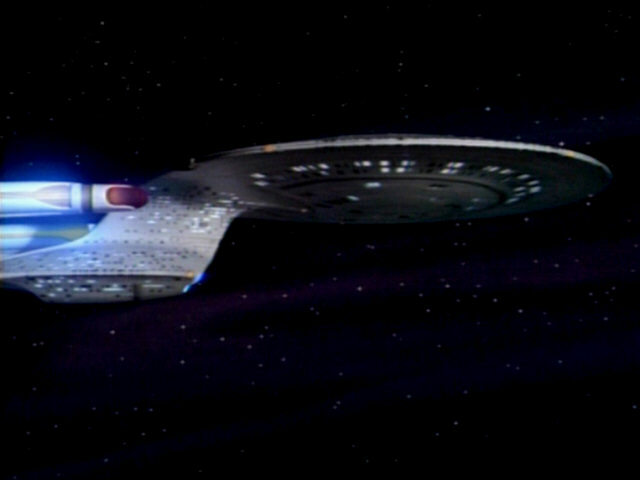 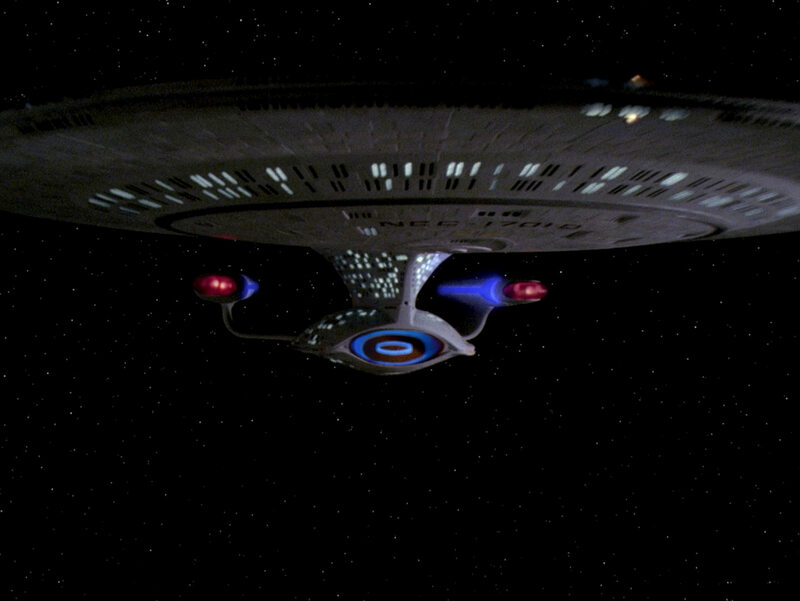 It features two side views of the USS Enterprise-D and first appeared in "Legacy". 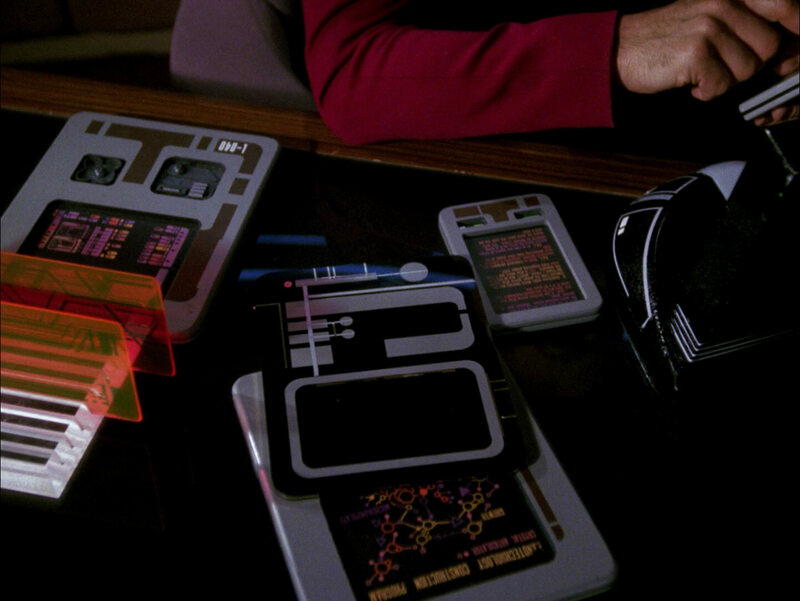 "The Bonding" HD A better look at the PADDs in HD. 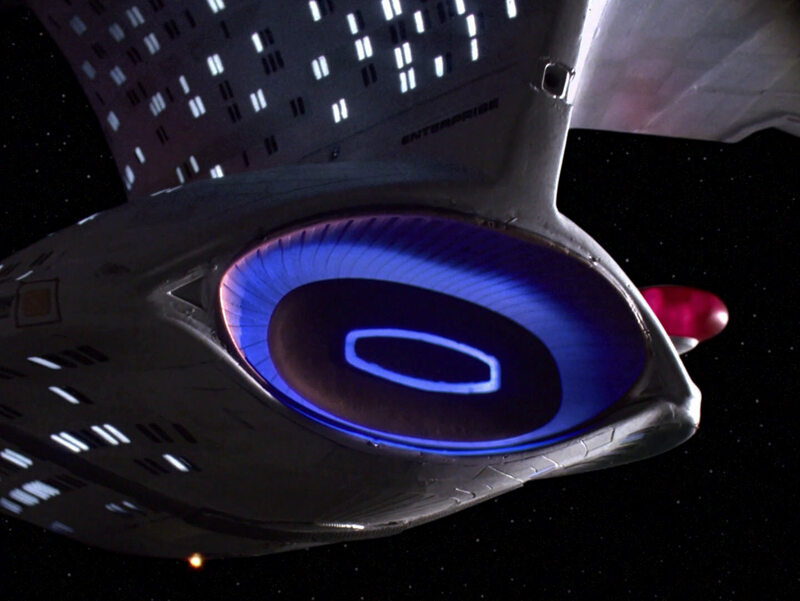 A nice close-up of the deflector dish of the USS Enterprise-D. 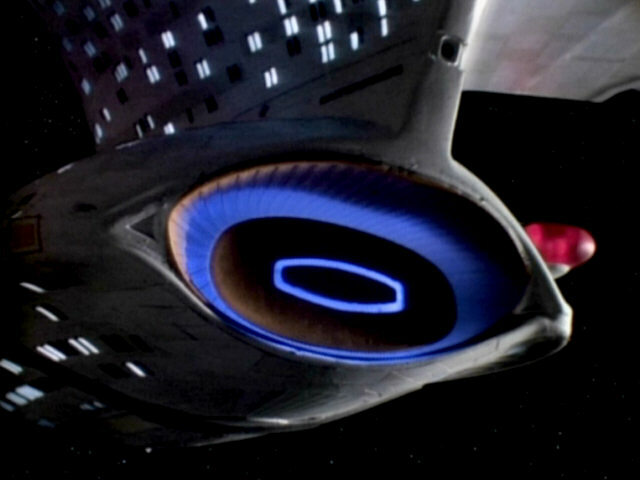 The dish was also seen up close in "The Best of Both Worlds I", but different footage was used in that episode. 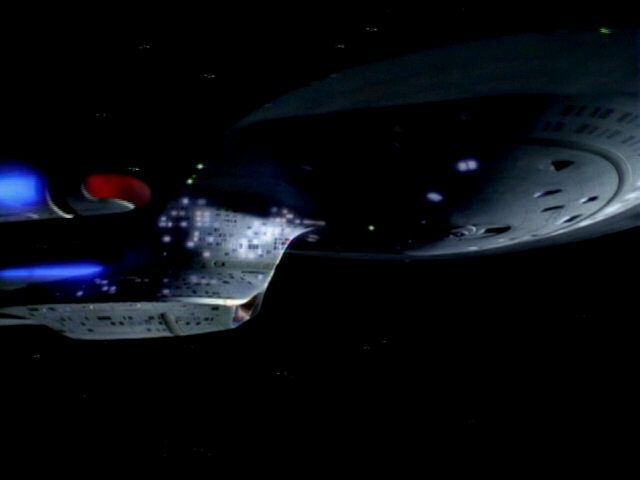 Footage from "Where Silence Has Lease" shows the 6-foot model from a similar angle. 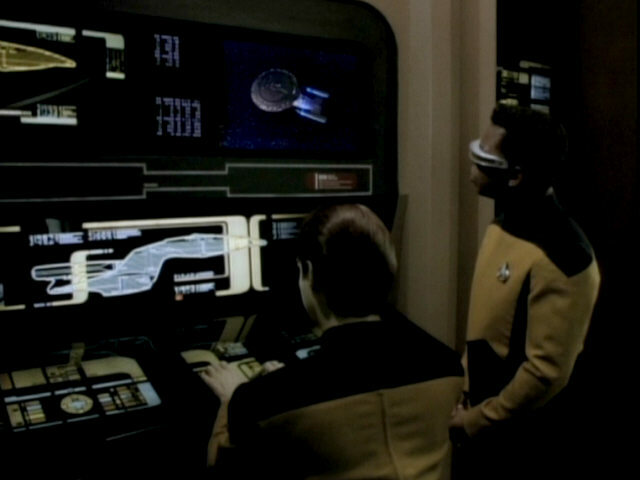 Has Lease" The deflector in HD. 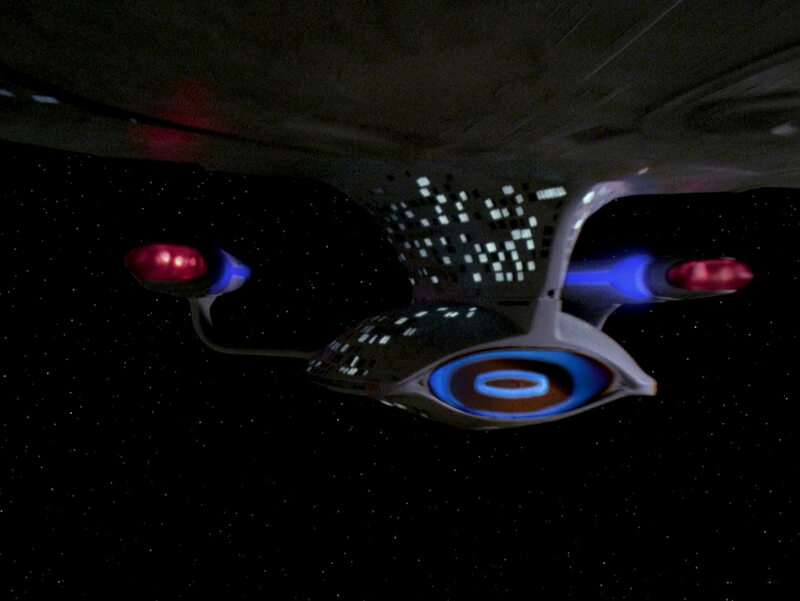 We can clearly see some imperfections in the finish of the model around the deflector dish. 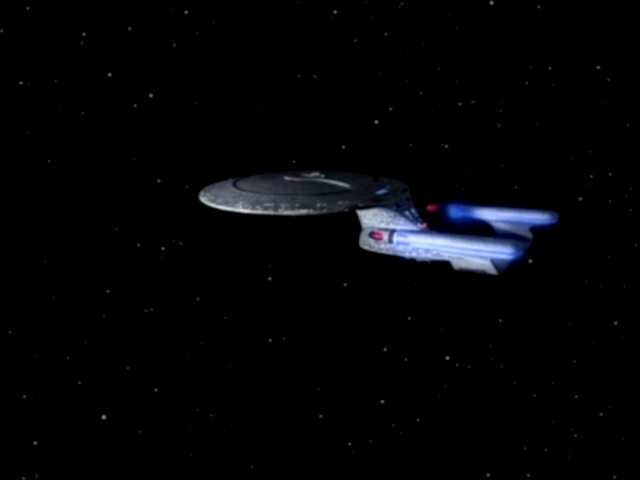 The USS Enterprise-D escapes from the pull of the two-dimensional lifeforms, affording a final, close look at the string. 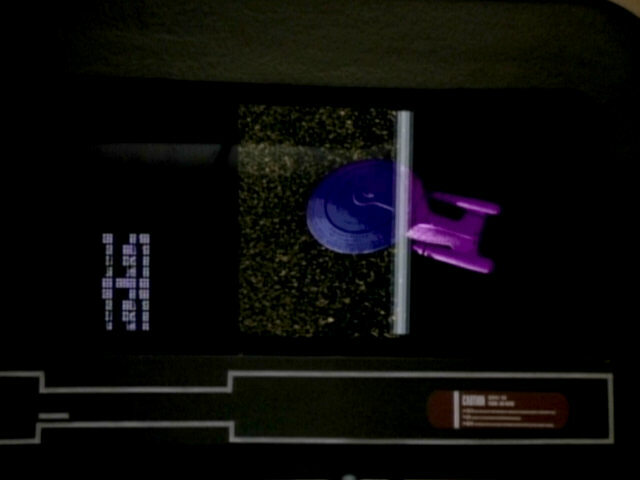 The footage of the 4-foot model was also newly filmed for this episode. 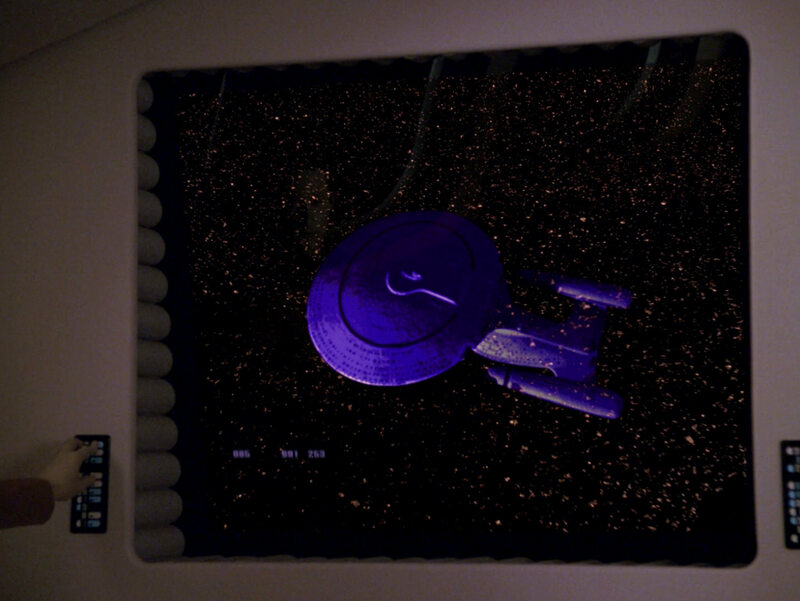 The reconstructed shots in HD. 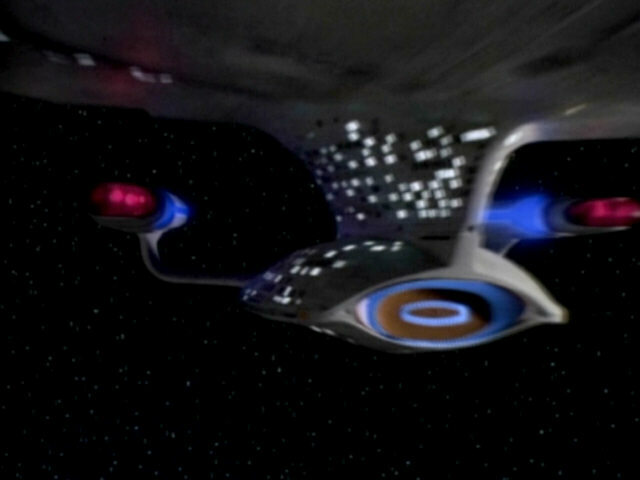 Two new, often re-used shots of the 4-foot model first approaching and then flying away from the camera are first seen in this episode. 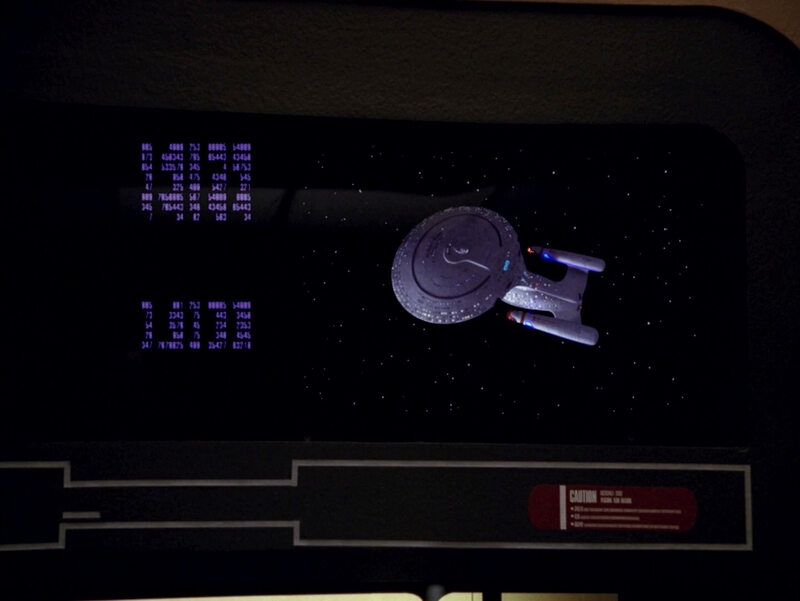 The stills from various season 1 episodes show what the 6-foot model looks like from similar angles. 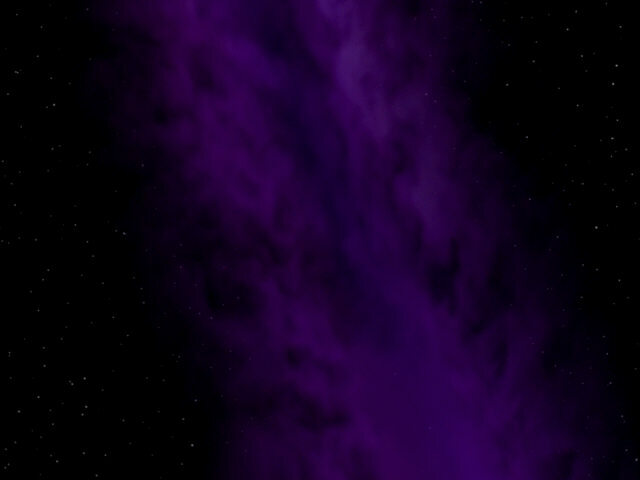 "Heart of Glory" The sequence in HD.